I had read about 11th Street Records before heading to Las Vegas, but it was a bit of a trek from our hotel, so I wasn’t sure that I’d make it there. As it turned out, I stumbled into it at the end of an afternoon of wandering Freemont Street – the original casino strip in Vegas. First, got to tell you about Evel Pie. 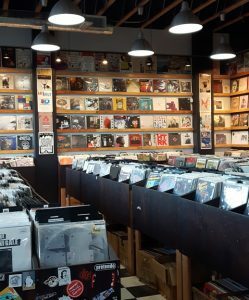 It’s at the south end of the Freemont strip and is a must stop on your way to 11th Street Records. Hit happy hour and get a jug of beer and a massive cheese pizza for $20. Make sure you have a friend or two because the five of us couldn’t finish off the pizza. Interestingly, the jug of beer seemed to be no problem. We wandered further south on Freemont – go during day light hours as it is a bit sketchy after dark. You’ll notice the remaining impacts of the housing crisis of 2008. Lots of empty building lots and some boarded up buildings. I love walking into a record shop because inevitably you get a friendly greeting. No pressure. Just a warm acknowledgment of membership in the obsessive world of vinyl collecting. I was greeted by the fellow behind the cash and stacks of vinyl who went by the moniker “Fish”. Super nice guy who found me a Kate Bush album that had just come in. Like most used vinyl stores, 11th Street Records had the cheap crates where you could spend hours looking for that gem you didn’t even know you wanted. I tend to head for the sorted crates where I can find the tab for Kate Bush and flip through whatever they have. Another nice feature of 11th Street is y grade many of the records they have. This is done largely for the online side of sales. They have a good presence on Discogs where Records need to be grade if a retailer wants any chance of making a sale in a pretty crowded market. Unlike many vintage record store, 11th Street is well organized with lots of natural outdoor lighting. I’ve visited too many Record stores in dingy basements where you have to wait twenty minutes for your eyes to adjust when you emerge. So what did I score at on my visit? I mentioned to Fish that I was looking for Kate Bush Kick Inside. He was pretty sure they didn’t have that one, but did pull out Never Forever. It hadn’t been priced so he went to Discogs and based on the very good condition of both the sleeve and record, priced it at $20. Being the cheapskate that I am, and having already bought three records, I offered $15 which was accepted. I left a happy man. I also bought a nice copy of Elton John’s double LP Blue Moves, Andreas Vollenweider Behind the Gardens, Behind the Wall, Under the Tree. This is one I’ve been looking for for awhile. 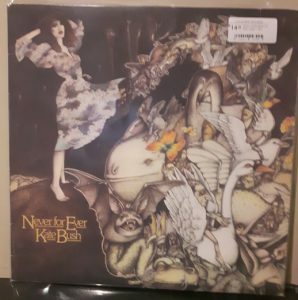 It can be found on Discogs, but being in Canada, shipping costs often add $15-20 to the cost, so its nice to be able to find it in a store. I also picked up Jim and Indrig Croce Another Day, Another Town for $3. This is a Pickwick/33 pressing: not the original Capitol Records pressing. This is just one of hundreds of albums that was deleted from the catalogs of the major labels and re-released by Pickwick. Pickwick was known for releasing “sound alike” bands, but as far as I know, this is really Jim Croce and his wife Ingrid. The 11th Street building also houses National Southwestern Recording Studio – this is a recording studio modeled after the standards of a mid-twentieth century analogue recording studio – according to their website. Fish told me that such notables as Todd Rundgren and Las Vegas natives, The Killers. A great shop to visit in person or on line.